If readers of this blog were the only ones voting, Mitt Romney would win in a landslide with 70 percent of the vote and Gary Johnson would edge out Barack Obama for second place. But I have a sneaking suspicion that readers of International Liberty are not quite representative of the overall population (I need more looters and moochers in my audience, sort of like what you see in this cartoon). Yes, I’m going to be bold and say that Obama will get more than 12.5 percent of the vote. Indeed, I’m guessing he’ll get at least a plurality of the vote. And I’m specifically predicting he’ll get a majority of the electoral college. 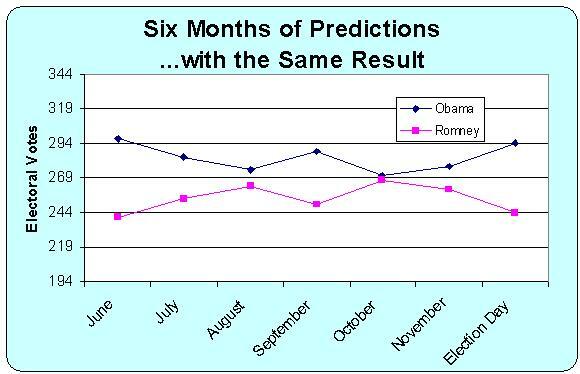 I’ve been predicting that Obama would win re-election for the past six months, and I see no reason to change my mind now that it’s election day. 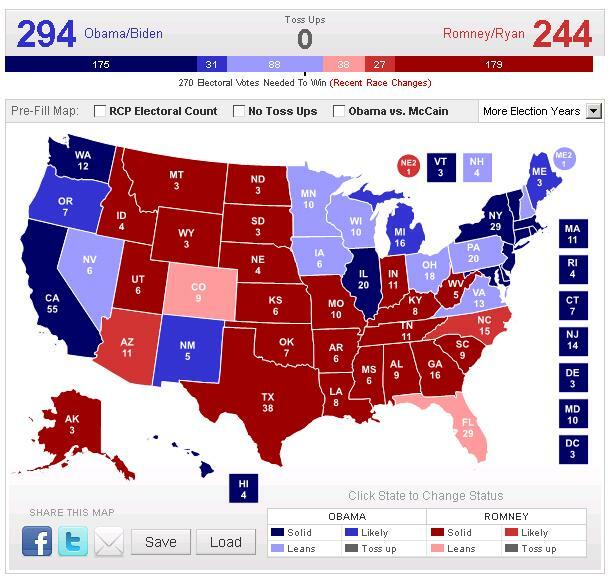 I’m even moving two more states – New Hampshire and Virginia – into Obama’s column, which will be enough to give him a 294-244 margin in the electoral college. As you can see from the large number of states in the “leaning” category, I don’t have a high level of confidence in my prediction. And plenty of my Republican friends have made strong arguments that the polls are flawed because of “turnout” assumptions. But I have no competence to judge the veracity of these claims, so I’m going with my gut instinct and calling it for the Spender-in-Chief. If my guess of an Obama victory turns out to be correct, I suppose I could claim special insight because of my January 1 prediction that Obama would win if the unemployment rate fell under 8 percent. But as you can see from this graph, I’ve always shown Obama ahead, even when the joblessness rate was higher. For what it’s worth, I don’t think there’s anything terribly unusual or unconventional about my predictions for the electoral college. But I am going to be a non-conformist in my guesses about the partisan breakdown of the U.S. House and U.S. Senate. Republicans began the year with high hopes of taking control of the Senate, but a series of mis-steps have hurt the GOP and some people even predict they will lose seats. That’s possible, but I’m going out on a limb and predicting a two-seat gain for Republicans. I’m also going to be a non-conformist in my predictions for the lower chamber, guessing a one-seat pick-up for the GOP. I’ll also make two final predictions. First, drawing from my post yesterday about key ballot initiatives, I predict that California voters will reject all the proposed tax increases. This will prove that left-wingers are capable of being right-wingers when their own money is on the table. Second, I’ll offer a prediction that’s about as controversial as asserting that the sun will rise in the east and set in the west. I predict that government will get even bigger over the next four years, which will mean more corruption and weaker economic performance. P.S. My predictions for the U.S. Senate assume that the independent candidate will win in Maine and will ally himself with the Democrats. Government will get bigger, economic growth will wane into being ever more sub-par compared to the five percent aggregate annual worldwide growth trendline — and America WILL decline. Even more importantly, the economic distress of decline will predictably cause voters to huddle up together even more and demand ever more mandatory collectivism and “government help”. Effort-reward curves will become even flatter, demotivating both the most productive, through higher levels of mandatory “fair contributions”, as well as the less productive, by insulating them from the consequences of mediocrity and bringing high marginal tax rates down into the middle and lower class. Independent private enterprise will be mired in ever higher disincentives in the form of regulations, subsidies and taxes that steer the economy towards the favored unimaginative central plans — those plans that are typical of an electorate that wants to collectively manage the economy using the average intelligence of centralized voter planning rather than the total aggregate intelligence utilized by capitalism and free enterprise. It is virtually impossible that America will remain most competitive nation under such mediocre mentality. The American psyche has finally completed its journey and converged to the natural human average. His prosperity will inevitably follow. Self-sufficiency and free enterprise are declining in America at the very same time when it is rising in the three billion people of the once dormant third world. Convergence and the end to American wealth exceptionalism is near. Take it from an Ex-European: Time to hang your shorts and live a few years of relaxed existence, in large part compliments of the HopNChangers’ momentum who may keep working for a few more years as their HopNChange bumper stickers fade away. But do make exit plans. The vicious cycle conversion into a desperate Pitchfork Democracy is well under way in America today. If you wait to take action when the pendulum is obviously swinging in the opposite direction it will be too late. Way too late. So procure a life boat, take the incentives to early retirement compliments of the other people’s work (i.e. ObamaCare) and whatever other goodies come your way after the next election, and live a happy few years. But make your exit as America enters the French stage. Don’t wait until it becomes Argentina. The pitchforks will get nasty if you leave any grain in your barn. This life has already started for me. Hopefully I’ll have ever more time to blog my journey to indolence here on International Liberty. So thanks for your wallets suckers! Yes, especially you HopNChangers! And you may want to start considering VAT, so that I can live a few more extra indolent years on your work before I bail out. Well, come on, just try a little bit of VAT. If it doesn’t work you can always roll it back. Can’t you? As an immigrant, my relocation to America will probably unfold as: “Come for the accumulated wealth, stay for the redistribution – useful idiots are about to hand it over to you – under the banners and songs of HopNChange”. There is no Hope in such Change. That is Europeanization, and those of us who lived through it know where it’s all headed. But if you think that “patriotic” Americans will refrain from such behaviors, think again! Don’t take my word for it. We’ll find out soon enough. Notice in the western, non-border states, NM stands out like a sore thumb. Not coincidentally, it is the poorest of all these states, and it wouldn’t stretch things to suggest it has become the most corrupt since Johnson left office. 8 years of Bill Richardson will do that to you, and his new Republican substitute is no prize. I hope you are wrong. If you are right then God help us. We will become France. Maybe that is what you were hoping for all along. Remember you preferred France choose the most liberal president so they will see that socialism doesn’t work.